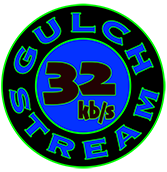 Congratulations … As of December 15th … Gulch Radio has become a fully licensed LPFM station with coverage all the way to Flagstaff. … [the, ed.] format is outstanding, commercial free, eclectic, diverse, and wonderful, especially if you love music from the Golden Age. If you aren’t near Jerome, take a listen to it online and send … a great big pat on the back. Fan mail is always welcome. A lot of work goes into building and maintaining a station like this. It’s a labor of love and it’s entirely done for your benefit. The least you can do is drop an email to say thanks and congratulations. Hey cool! Thanks for tuning in! Must be a beautiful morning in San Carlos – maybe we’ll do a remote from the beach someday. Must have tuned in at a bad time dude wtf are you playing ? Almost punched my radio off the shelf and had to change the station! The old blues you play is great I thought I found a new station but being stuck inside listing this morning about killed me ! Hey Mike – Sorry to jolt the train, we change up the music a bit on the weekends. Some folks like it and some don’t. Thank god they put dials on radios. Thanks for listening, we’ll be back to normal Monday morning. Love, love, love the edition of your station to the Verde Valley. Do you have, or are you planning on creating bumper stickers? I would love to get one to help you advertise. I’ve been telling people by word of mouth. So far I’ve noticed a buzz. Keep up the good work! Hi Angela – glad you enjoy the station. WE do have bumper stickers, if you will send us an email to: gulchradio@hotmail.com with your address we’ll send you some. You can also pick them up at Tommy Rocks Music Store in Jerome, just below the Post Office on Main St. Thanks for listening and writing. Yes! I have found word of mouth is like..yelling! Gulch is here to stay! Have talked with many fans. .they are HAPPY! Bumper snickers really need to b obtainable down the hill from Twinkle-Town! Better late than never as to my reply to thank u for that. I would gladly drive round down here to distribute snickers. .too few visible in C-wood. U hav my info..many establishments on my list and yors. 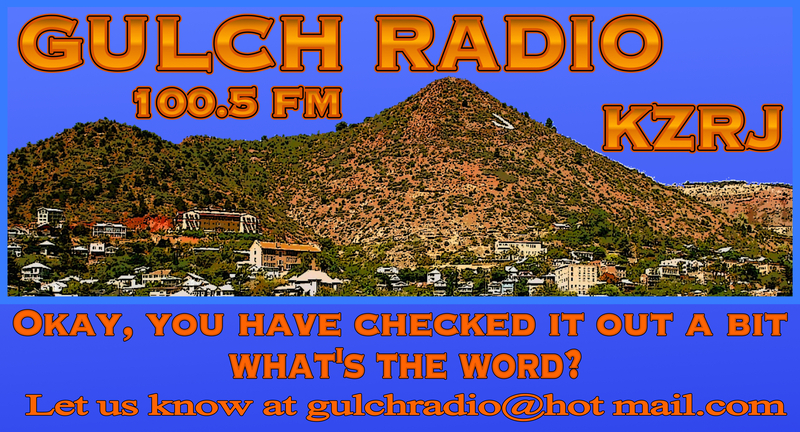 Thanks,again,GULCH RADIO,for bringing THE BEST MUSIC to the Verde Valley. .and ALL OVER THE WORLD! So glad I found you, been telling all my friends. I’m a mail carrier in sedona so know a lot of people. Gulch reminds me of a station I listened to in early 70’s out of Gilroy, CA. Called KFAT. First time I heard mothers of invention. Keep it up so refreshing. Any chance you have access to any “cold blood” Lydia pence? Can’t find much. Thanks. Thanks for writing Victoria! Not sure if we have any Lydia – we’ll check it out. KFAT is still around, but has been KPIG out of Freedom, California for about 20 years, Victoria. Have you ever gone to a FAT Fry? Nope – we’ve never been. Thanks for your note Bill – we appreciate the feedback. Glad you enjoy the station! i found you yesterday , i’m listening from killeen tx. you guys have a great groove , reminds me of the the fm stations in ca. during the 70’s . i WILL pass the word about you. Hey Casey Jones – glad you are enjoying the tunes and thanks for telling folks to tune in! So when I stream the Gultch on my iPad there is no “Pause” or “Stop” button. The only way I have found to stop it is to shut down and restart the iPad. Really? Ahhhh, it is an endless loop. Click on “PLAY” on the home page takes you to the License page where you click on the GREEN button… that starts playing and reloads the Home page. This loop repeats never showing the “Pause” option. When you click on play, normally a mini-player page opens up off to the side with a pause button, album cover, volume, etc. I have never tuned the station in on an ipad so I’m not sure how the player behaves, although I have tuned in on an iphone and that is what happens, One way to turn it off would be to close the page. Or – go to the appstore and download the tunein.com app, search for “gulchradio” and you will have a choice of streams to chose, 32 or 96 – the tunein app will run in the background while you do other things on the ipad. We recently spent three weeks in the Cottonwood, Sedona area, my scan button found your station immediately and I never changed it. Back in Wisconsin we listen on the net. Keep up the good work, you have brightened our day! Hey Richard – thanks for the note and we’re glad you’re listening! J’uke – glad you like the station, thanks for writing – those musical Morons will be back to play! Fur sher! EVRY WKEND! LENNY&MIKE r so talented! I know they can give up their Saturdays without their families missing them!! Cuz ALL the GULCH fans are family, too! I just love u..all the time! So much so I am burnin’ burgers rite now..wait..wait..just flipped ’em..all is good! Today is the 1st day I listened to Friday News Roundup with D.Rehm.and my favorite SciFri with the most entertaining “science geek”..I have been into “MY GULCH” so much..I think I need a nite in the Grand Hotel Further on..I shall save Friday morning for my NPR..just morning, mind u..the rest..Thanks! C U @ Music&Morons! I will have a “fan” surprise for u soon. .you’ll c it ’round c’town. GOTTA GO..BLUES ON! YAAHHH! THANKS! April 18th was a long time ago..the “fan surprise” I have been working on is 99.99% complete. ? Can I e-mail u a pic of it? Thanks, to THE BEST RADIO TUNES in the Verde Valley. .and ALL AROUND THE WORLD! Hey Morons! Loving your show! ‘Angry Eyes’ playing right now. Great stuff! Keep up the good work! The Morons thank you for writing and listening. Your station is like listening to KDKB in the 60’s. I LOVE it. So glad we get it now up in this neighborhood. Thanks for the note Mary, we’re flattered by the comparison and we’re glad to be in your neighborhood. Thanks again for writing. Great song with a lot of percussion!! Sitting on the Sonny side!! If there is anyway to give me the name and album for the song it would be greatly appreciated!! Thanks for the great music!!! she is one hot tamale. Now when I get to where I am going I don’t want to get out of my vehicle and turn the radio off. But yesterday, 5-26-15 at 2:45 pm mst I had to. what the heck was playing? Glad your listening – every now and then we play something somebody hates – it’s inevitable.It was either “Little Wing” Stevie Ray Vaughn or “Shame the Devil” by Robin Trower. Neither of which will play again for five weeks so you are safe. Having moved to Cottonwood, as an AZ. Local of 37 years…I have to remark that your station is one of the ‘Freest’ on the airwaves, that Ive heard in a long while. Though Im old enough to not be gullible about how free you actually might be [what with advertising dollars and what not] I do still think you all are doing a great job at keeping the airwaves clearer, in these times of suffocation mediocrity. Please dont stop… oh Baby, please dont stop!. Thanks Michael and thanks for listening. We’ll do our best not to disappoint you! Listening to your station all the time from the bottom of the hill. You guys are awesome! Best station I’ve listened to in a VERY long time. Picked up my Gulch bumper stickers at Tommy Rocks and had Anne Bassett autograph my copy of “Home Sweet Jerome”. It was a great Jerome weekend! Hey Claire in Clarkdale – thanks for the note, we’re glad you’re tuned in and enjoying the station and Tommy, indeed, rocks! Hoping u get some bumper snickers @ some fine establishments down here in Old Town C-wood..like Hippie Emporium, and further on like Verde Lea Market..Desert Dancer….Walmarts (ha!, just kiddin’! Thanks! Rockin’ it good as promised Carsos! Nice! Thanks, Michael. It’s always fun to hear from pleased listeners. Thanks for THE BEST-EVER!!! !,broadcast of the DEAD I hav heard thus far.I was lucky enuff to take part in their concert, OUTSIDE!, in Farmington, Maine back in college days..they SANG to us for…atleast…4&1/2 HOURS!!! 2nite’s show (thanks to you),has definitely brought back wicked fond memories. Thanks to David..for a thrilling compilation! Hey Tom – thanks for writing, glad you are enjoying the tunes! Cool – thanks for listening and keeping us tuned in at Wal-Mart! How come your website no longer shows the “now Playing” song? Due to technical limitations on our equipment, when we are broadcasting live, in the studios our stream can’t capture the song titles so it just shows the name of the show. One of these days we’ll figure it out. Tonite @ approx. 7:50pm..? Who was that/what was that song w/ words “intelligent design”? Thanks. not sure which song that was, but “Don’t Waste My Time” by Catch 22 played at about that time. Sorry took so long for me to respond. I don’t know how you do it, but the tunes you’ve been playin’ this afternoon have swept me away to another place & time — don’t want to ever leave. Hi Lynn – hey, thanks for the note. It’s great to hear from listeners enjoying the music. Glad we could help you get to that other place! So do we – thanks for writing. Best station EVER! LOOOOOVE the Native American music you play! No one is playing the stuff you play anymore! Hey Cindy -thanks for the good words – we appreciate it and I will pass your note onto Gregg the show host. Thanks for listening, hope you are staying nice and warm! A Dead Head from Palo Alto, Ca. Fell in with Indians up in Flag – 4 corners some years ago. They let me hang around. In October, I got a hip replacement and need to go back to work to pay the surprise co-pays etc. Great thing is I have a better attitude since mobility is increased. Is the office as open as it seems in the picture on the website? Hey Mitch – the Geezer is 71 – I do believe he qualifies for membership in the club of beat up but probably perky oldies. Glad to read your hip replacement has helped out the declining mobility, The Geezer know first hand how tough that is Not sure what you mean by “the office open” – if you mean is the town open and friendly yes it. More beat than beat up, I’d say, about the geezer. I only ask the imper tenant question because lots of young’uns with grey hair have been tried to assert seniority, lacking about 30 years of life experience. Been trying to get the 100.5 signal around the Flag area. Not much luck. I got a fresh allocation of bandwidth and am listening to your excellent stream now. I’m still working on alternative to commercial media/radio aka pirate radio. I own a low power fm transmitter which is legal so I don’t think it qualifies as really “pirate,” though I think it might if I get an eye patch…. at least stylistically. I don’t think I even really need to get the eye patch if I can effect a swashbuckling affect. The temptation to push the legal limits on the low power thing is in me. I’m busy hot-roding The limited equipment I have to do DJ type blogs with audio clips or etc. Two of the tire/wheels for the “pirate ship’s” trailer are still doing utility trailer cleanup duty. But the ship is about to launch. Licence for the trailer, etc. Office open? I mean how when would it be good to meet, perhaps explore space where co-operation might be fun. love the webcam, but one suggestion….a shroud of some sort would be great so as to protect the lens from rain/snow….gets difficult to observe anything! Thanks again! Thanks for the note – we call the distortion “art” – actually we’re learning as we go along, The camera is up there pretty high so accessing it is a challenge. Understood, just the fact that the cam is available is fantastic! Keep up the good work. The short test of my volunteer micro power translator of your signal east of STAR school on 88.3 good. Noise from cheap audio cables(?) noticeable. Cheap microphone did well especially with only $4 expectations. No complaints yet; probably nobody but me heard anything. I am Cactus 7, your low powered cloud based media dead-head. CFTC is an alternative media adventure yet to be fully discovered. “Pirate style radio” is the closest way to share a glimpse of my vision. CFTC strives for strict legality while upsetting convention and breaking traditions whenever artistically interesting. Wherever the law is unclear, or contradictory, CFTC aims at being helpful, having fun, and being adventurous. Come along with us. Let the adventure begin! Cactus 7. A Posed Pic! CHOPS: In the 1970’s I lived on what the neighbors called a “hippy commune.” Now I live a mostly tribal life with Native Americans. Being a visible white man, I endure my portion of prejudgment. Mostly I am thought of as being white-man lazy. controversy, I am for Obama, and Care. Giddily happy that the Americans have elected Obama giving hope to the majority of Americans children who are not white as the driven snow. Could a pirate radio station be or have been? 1 One of the offshore, (and therefore legal?,) stations that played rock and roll, (Beatles,) for otherwise captive BBC audiences in the 1960’s. 2. Any station that transmits their signal with more than the authorized power, or violates some other regulation. 3. Stations whose staff dressed up in costumes paying allegiance to thieves,,, think of suits promoting exploitive deals. I’ll stop here, hoping that there will be much more discussion of the concept of piracy. On the open seas lone sailors are protected only by themselves, obscurity, or by traveling in convoy lanes protected by heavy traffic and powerful maritime nations navies. Clicking around the net and especially the FCC’s sites, my low power / internet radio gypsy pirate style radio is seeming more complicated than it did at first. The micro power only reaches a couple of hundred feet, even on a tall, ( Mast of a trailered boat,) antenna. The low power is non commercial licenses are no longer acted upon. These are the most interesting to me. They include “travelers information” stations and I think they are the ones I have seen and heard at the entrances to some of the national parks and monuments in the area. Cactus 7, the modern style radio pirate will conquer enslaving mediocrity without physical violence. Cactus 7, radio style pirate, sails seas congested with selfish capitalistic traffic. The confusion zone near “Illegal,’ and “outside the enforcement zone”, are familiar waters to radio Pirate, Cactus 7. Hey, from a couple of listeners in North Wales, UK. Could you let us know the artist of the “Runaway” track we hear when you are signing off the Rick n Roll Breakfast show? Hi Fiona and Michael – two guys do that, I think David Grissmon is one and I don’t remember the other artists name. Sorry I’m not more help there. Thanks Michael ~ Glad you enjoyed it. Stay tuned to the Gulch for a lot of great shows! And come back especially in 2 weeks for my next show. Hi! This is Sonia from Punta del Este, Uruguay. Robert and I are watching the sunrise at Jerome and enjoying your music. Big hugs! Good morning Sonia – thanks for listening and glad you’reenjoying the sunrise, was a pretty one! Great station. Whoda thunk something this good from our very own Jerome? forgive me if this comment has already been made, but it would be nice if the live feed was not lost every time you switched between pages on the site. Keep it up. You guys are doing a great job. Thanks for the note. Glad you enjoy the station and happy to hear the problem fixed itself – I wish they all would. Thank you for the jams. Chilling on the deck, watching the storm, the current playlist is helping. Stevie’s version of little wing just brought tears. So thankful for all of us. Chaka. Adobe Adam in sedona. Thanks for the note Adam, good to hear were coming in Sedona, Thanks for listening. found the gulch last year while visiting friends in cornville-yaaaay! i listen to the radio most in the car and i cant tell you how many times i got to where i was going and didnt want to get out of the car cuz the music was so perfect…and not just til the end of the song..many times for several songs before i would get out.. fantabulous stuff! when i got back to calif i immediately found out how i could listen from here!! thanks for makin that possible~! rock on. Hi Karen – very cool, glad you found us and thanks for taking us on the road with. We appreciate the letter – they keep us going. Aloha, Listening to gulch radio in Hawaii! It’s island stranded time here, sounds good with the ocean in the background! Best station in AZ, keep rocking! Hey Wyatt! Glad to have you surfing the tunes on Gulch Radio, thanks for writing and we’ll do our best! Muy Bueno Geezer Rock Show! You played “Feelin’ Good Again” by Robert Earl Keen today and I caught it by chance. I’d never heard of him before and now I’m hooked. Thanks!! Cool -glad you like it. REK does lot’s of great songs. Thanks for writing and thanks for listening. Visiting from Florida. Awesome play list. Enjoyed, Jerome should be proud. Keep the airwaves coming. THANK YOU GULCH RADIO – you have saved my sanity and have lifted me out of my deep depression about the mainstream radio stations available in this area (Prescott, Verde Valley, Flagstaff). I actually float on the River of Peace, Love and Happiness when I’m listening to all the GREAT music you play . Many thanks and much gratitude from me to you ! Hi Cottonwood Listener – glad we can contribute to sanity – it’s our pleasure. Thanks very much for listening and writing. We’re happy to be floating that river with you. I wish for a more diverse stream of music… more unknown, more female vocalists, more ssttrreettcchh…. less repetition… less blues… more current bluegrass, and whatever happened to punk rock?… pleeeezzz. and q. Sorry I didn’t respond sooner, just found your letter – if the mix doesn’t please you, what can we say, there are 60,000 streaming radio stations and 14,000 over the air stations to choose from, many play punk and whatever so check’em out, we’re sure that you can find something that pleases you. Good luck – rock on! WhaT IS UP,the left channel over the air in Sedona not very strong,also online weak thanks best station in the world!! Thanks for writing – our mixing board just failed so it’s going to take us a little while to get it fixed. Thanks for listening and sorry for the funky audio. Had a few precious moments watching the cam and listening to FZ Hour. Good night, Ricardo! I am listening to Gulch Radio here online in Pakistan and you guys are playing some good rock n roll tunes. I usually listen to Gulch radio at work and just cruise through time. Good variety! Hi Ali – thanks for writing to us. We love to hear from listeners, especially from other parts of the world. Glad you enjoy cruisin’ to the tunes. Hi, Love your station! I was driving home tonight, 7/27, and around 8:40 you were playing a song with a South American tone, with acoustic guitars harmonizing, conga, and other instrumentation. There were no vocals in the part of the song I heard. The acoustic guitars kind of had a CSN quality (Judy Blue Eyes) in certain spots of the song. I love it and would like to know what song it is. I need to get a copy of it. Thanks for listening and thanks for loving! Thank you soooooo very much for the info and the quick reply. Keep on playing the great selections! Me and my wife are visiting Sedona and found your station. By far the best thing on the radio. Looking forward to streaming when we get home. We would love to stop by and say hi. OK what we really want is a T-shirt or two. Is there some in Jerome? We leave in the morning and plan on stopping by Jerome and do some shopping. Love you all. Hi Raymond – thanks for the letter, glad you are enjoying the station. Sorry, no t-shirts yet, we’re a non-profit and we can’t afford them, BUT we do have terrific bumper stickers. Made In Jerome Pottery and Designs On You clothing may have some, if they don’t you send us your address, send it to gulchradio@hotmail.com we’ll send you some. Thank you so much for playing the songs for Don Robertson. He will be truly missed. My pleasure – he is missed, indeed. Hi Ruth and Bill way over on the other side – glad you are listening and hope you both are well. I am Brazilian and I live in the city of Goiânia near Brasilia, the capital of Brazil. I listen to the radio every day. Hi Carlos in Brasil – thanks for writing to us and thanks for listening. Your English is perfect. The best to you and yours as well! Hi Niki – happy new year to you too. It’s never too late to wish and to be happy! Most of the time while driving, when I hear great music that I don’t recognize, I just live with not knowing but tonight I am compelled to make an exception. I would like the bits on the last tune playing right before “Rockin’ In the Days of Confusion” began. this mystery song may have been cut short for the program to begin on time. What was the name of that song and who was performing? It was 7:59 p.m. on 2/17/2017. Thanks. Also, great job. Best radio station since the early 70’s KMET in Los Angeles. Good morning Mark – thanks for listening and writing, never hurts to be compared to KMET. The song you wanted was “Stratus” by Billy Cobham from the album Spectrum on Atlantic Records. Hi Marty – thanks for the good words, we’re glad you are enjoying the station. We enjoy putting it together and letters like yours are a great reward. I’m listening to the radio here in Brazil, excellent music. Bom dia Marcio! Thanks for listening, glad you like the music. I was listening to Gulch today 11:30 am to around 1 pm. I liked many of the songs and wanted to listen again but when I tried to locate the playlist it did not show the songs just the name of the show for those times. Hi Betina – you were listening to UnderCurrents show number 4228, hours 3 and 4. Go to UnderCurrents website: http://www.undercurrentsradio.net When you are there look across the top and click on “playlists” Search for 4228, which would be about a week ago (original air date) and look for hours 3 and 4. Thanks very much for listening and this should get you there. thought i heard that mr martin might be coming on next…??? Hi Niki – yes he is here right now, will say hi! Hello, saw you on the Hamilton Transmitter site. listened in on 96 and 36 KBS both sound good..I did not know 36 kbs could sound so good. I have that same tower and I am looking to get a Rangemaster Transmitter. Do you have any gear left over I could buy ? Hi Don – thnaks for the good words about our stream – took a little work to get the 32kbps stream to sound good. Sorry to tell we sold all of the AM gear except for a professional quality audio equalizer. One transmitter went to texas and the other to Las Vegas. Hey I have been unable to listen tonight to your station. And neither your website or Tune in app are working.And my Spotify is working and called my cable company and no problems with them.Sure hope this is fixed soon.Your station only thing keeps me sane thru intense back pain.thx Dan Colorado. Hi Dan – sorry, a situation beyond our control. A backhoe dug up the internet lines serving Northern Arizona yesterday morning. Service was back around 10:40 PM last night. After a little work this morning resetting things, we are up and running. WHY CAN’T I STREAM YOUR STATION FROM WORK. I WORK IN COTTONWOOD AND WHEN I CLICK ON NOTHING KEEPS HAPPENING. PLEASE EMAIL YOUR SUGGESTIONS/REPAIR SOLUTIONS TO ridesafe@breezydog.net. THANK YOU FOR YOUR HELP AND KEEP UP THE GOOD TUNES. Love your music station and the livecam. Together, they are the things that I go to when I need some peace. And that’s often. Every single day. I can endure being here in Texas if I can get my sound and vision of Jerome, Arizona. But you’ve been dark for a few days now. Absolutely killed me. I see your note about the problem and its fix…but I’m still not getting anything. Anyway, hope you get back on your feet. Thanks for all you do. You people are awesome. listening. For listening problems, please write to us at: gulchradio@hotmail.com – let us know if get it working or are still having problems. Good job on the Houston sound pray for Texas ……zzz top …..Rodney Crowell another great singer song writer from the Houston Area would be cool…. Hey james – thanks for writing. If you are listening we are featuring a bunch of Texas artists right now. God bless you all, wish I could be there to help you. Too old, just get in the way. Hi Richard from an old friend who you asked to be at your wedding to Pat back in the 70s but could not make it because I and partner in crime were Always at JESSE’S along with the Jerome population who came to talk to us. I have something to talk to you about and will be calling you soon, a new idea for you concerning you that I think you will find very exciting. I give you permission to use the email so I can talk to you in private. this is the guy who wore the Greek Fisherman’s hat, the Tall one with the vast knowledge of Music and the biggest collection of records in Arizona. Please just send an email. Thanks. Great Station and idea my friend. Love your music if there’s a chance to shout out and ask for a request I like to do so if you can play a little bit of Pat Travers maybe a little bit of Aldo Nova or some Triumph whichever hour that would all fit in that would be fantastic! Keep it up Gulch! Thanks for the note Mark. Glad you are enjoying the Gulch. We don’t have any songs by those artists, but we will check them out. You have become my favorite station. I love your selection of music. Hi Victor – thanks for writing. We’re glad to be your favorite radio station. Hope things are going well for you! Hey Victor – thanks for the note. We’re glad you listening and be assured you are one of our favorite listeners! Linda and William enjoying your station every morning from Prescott, can you play some Jackson Browne? Sidenote…We recently saw Danny O’Keefe-Tom Rush 10/8 concert at the Scottsdale Center for the Performing Arts! Hey good morning Linda and William -thanks for listening, glad you enjoy the station. Jackson Browne – Lawyers In Love for you! Good Morning Ric from Linda and William great picks this morning, always love to hear some Van Morrison, we’ve been listening to him for over 4o yrs, saw him in concert twice, just got his new album…Roll With The Punches..so glad we found your station recently! And we saw the great John Stewart perform in Scottsdale a few years before he died. So thanks for playing these guys! We love John Stewart – an all time great! Hi Linda – the playlist compiling company changed their software and it took several days for out lists to catch up – they are working now. Thanks for listening. Going through a breakup of 17 years. Your music this morning is tearing me apart. I heard you are currently experiencing a health challenge. I’m sending you healing thoughts and energy from Oregon. Get better soon big guy. You are much loved ! Blessings and support from Todd in Salem, Oregon. Just got set up to listen in through the internet feed. My sweetheart and I have missed the Sunday nights filled with the blues since we moved from Cottonwood (to the Tri-Cities of eastern WA) in early October. Now we’re all set! One other thing… the colorized photo of Jerome at the top of your home page would make a great jig-saw puzzle. Can we borrow? It is so good to have you back! Missed you for sure. Hi Todd – real happy to be home! Thanks for writing. Heard your station in a Jerome store. Been listening for a year now and tell everyone about you. On our way out and would like to know where you are. Merchandise??? For the last month or so I try to tune in on my car radio in Cottonwood, I get dead air! For several hours a day. What’s up, why is my favorite station missing? Waiting out my time, as I get ready for my Seasonal Summer employment up north. Ive been a fan of the Blues since my 20’s. I always come back to their healing power. To have them handy over the wavelengths, is a Blessed thing these days. Any idea why yr signal goes off the air at around 9–9:30 ? The transmitter has been going on and since late January because the night watchman at the complex where we are located is complaining our signal is wrecking his sleep – his families as well. He started going out and cutting the power to the station. The continous on and off has fried our transmitter and it is out for repairs. We will be back. Cannot access your station in Sedona on my FM receiver. Only get static. Our transmitter is down and out for repairs. Sorry, we will be back. Ric must be back at the controls, the music being played is great…again. Love the 5 to 8 time slot! Can’t get you down in Cornville any longer…been goin’ on for several weeks. Now, occasionally, I will pick up the station around 8:15-20 in the morning, but, then the signal stops around 5:30 PM or so…what gives? Love the Gulch!!! Multiple time friends have asked me what station I am listening to. They love the variety and so do I. Having difficulty getting your station in the morning hours recently (in Cottonwood) but will check out the steaming feature as my hubby misses his morning Gulch. Thanks for the show! Hi Margo – we will be back on the FM, could take several months. Excellent playlist yesterday! Perfect for working in my art studio. All the songs I forgot I remember! Maggi – thanks very much for listening. Glad you enjoyed the tunes. Unable to receive your radio signal here in Sedona on a radio tuner. Just get static. Got your signal before . What has happened? I was wondering why I can’t find you on the FM dial anymore?? I love the station and the variety, soooooooooooo cool. Why can I no longer get you on my car radio. I have 4 cars and 100.5 is nothing but static on each and every one. Streaming is good but I miss your tunes on the ride to and from work. I need the Ric and Roll show. Please help. Hi Gulch. Glad to have you back on my car radio again! Unfortunately the signal is really weak compared to how it was a couple months ago. Lots of static and I have to turn my radio way up. The station goes in and out too. Are there plans for a better signal in the future? Thanks, An Avid listener, Mike Y.
so they got you back on the air from some guy that said your transmission was making him sick..can he prove it? so are you on full blast? I’m having a bit of trouble hearing you and have to turn the sound way up….are you on full time yet? I hope all is going well…we miss our gulch radio !! Hi Mindy – sorry for the slow response. We were on a low power for awhile, we are off again as we had to dismantle our old site. Working on the new one and we hope to be on the air in two to three months. We miss you too! Hi Pat -we are working on our new transmitter site right now, I am hoping we’ll be up and running over the air in from two to three months. Things just move slowly, but they are moving. Good morning Pat – we will be back on the air in several months. We are working on the new site right now, so if the weather holds out etc we should be back fairly soon. Sorry for the slow response, I get way behind sometimes. I emailed you guys on August 11th last year (2017) and about two weeks later got Harvey put over four feet of water in my house here in Dickinson, Texas. My house that sits directly on Dickinson Bayou. Lost everything but our car and the clothes on our backs, but we made it out alive and that’s what matters. After ten months in a hotel we are finally back into our house. We have a long way to go to get back onto our feet, but what I said last year still stands…your music is incredible and your livecam keeps me going. But here’s my problem and why I’m writing…where’s the livecam? I really really need me some Jerome Arizona. Again, as I said last August, you people are awesome. Hi Jack – the live cam had to come down with the removal of the tower when we lost our lease this year. We are constructing a new antenna site and we will be making other plans for the camera after we build our new site. Thanks for writing. The live cam had to come down when we removed our transmitter tower. Sorry for the slow response, very glad you are all back together and I hope your rebuilding is going well. Hi. Do you all still play any Stella and the Phins? Love her voice. Yes e d0 – thanks for reminding em over her, I played a song this morning. Thanks for listening. I apologize to friends, but I’m not really enjoying this new playlist separda in another page of the site … as a listener when I hear something I do not know, I roll my eyes in the playlist to know who the voice or the song or the group is anyway. ..bato the eyes and note .. .. at home … because I hear you in my work, which helps me a lot … and I will search and listen more or mount in my playlist … I hope you review … thank you … rock rock long life to the rock …. and now that my country walks to a dictatorship so … let the rock come … but with the name in the playlist ali do play …. Hola Roberto – the new playlist format helps use with the process of reporting for royalty sales. The data collection on the old playlist suddenly quit working and couldn’t be repaired so we updated to the new version, which actually listens to the music and reports it – it seems to have a hard time with our stations id’s and promos coming up with some crazy stuff. Currently, it’s a work in progress. We’ve been working on the list display. It does seem to be having some problems. The good news is “test-test” has been banished back the ether (or ethernet) from which it came. oh god the playlist returns!! thanks thanks thanks!!! Hey Ric, Sending salutations from back east, Shrewsbury, PA. Miss you guys out in the Verde Valley. Hope to return real soon. Backtracking on E-mails, it looks like your station has been under construction, or should I say deconstruction. I sure do miss the valley cam from atop Jerome. Hi there…..I’m trying to play gulch radio using Firefox. It won’t play. If I use Safari, it plays fine. Any suggestions as to what I need to do for your music to play on Firefox? Sérgio Mendes!! Nice song! thanks!!! I’ve been a regular listener to Gulch for the past 2 years. I appreciate and enjoy your musical selections and that you are commercial free. Your station IDs are not too frequent. The only ones that annoy me are the alarm clock and the foghorn, but besides that I’m usually in a cool groove listening throughout the day. I listen using Winamp. With all other stations it displays this artist name and song title then the station name. Gulch used to always display the song title and artist, but I noticed about 6 weeks ago, if no longer displays, it’s frustrating especially when I hear a song I really like, I want to see who it is and I can’t unless I go to your website. Here’s what I see – Current title: Test+test. Would you please restore that? Thanks! Hi Mark – we are having some problem right now with the tuner and song title and haven’t figured it out yet. Most of our time right now is being spent on operating the station and building our new over the air replacement facility. I’ll try and get back to it. By the way the song titles display on our 32kbps stream. It’s all such a mystery. Hi Mark – the mysterious problem, well one of them anyway, has been solved. The streaming titles are back to normal. Had to get outside help to fix that one. Been playing your station since 9:00am, it’s after 3 now and have no intention of turning it off anytime soon. Like your station, like your style. Nice wide variety. Definitely will be tuning in regularly. Thanks very much for the note! Yes we do – we hope to begin test broadcasting in mid-April. I miss listening in the car! Hey Bob – FM update, we are on the air now – we’re still working on the station so we are running the power at a lower level – I suspect in a month or two we’ll have it better together. How did I miss “The music Never Stopped” ? Good morning Todd. Hmmmnnnn … looking for answer to question, other than, the thrill is in discovery. If you know you played it then I obviously missed it. Hola Roberto – we’ve got lot’s of Jeff Healy in our playlists, – lot’s by our standards at least – we play something by him several times a day, lot’s of different titles in the library! Down here listening in St.Thomas us virgin islands. Morning Kevin – we will do that! Been tuning in for years on my computer here in Dickinson TX where we’re still recovering from Hurricane Harvey’s flood. As I’ve written you in the past…your music inspires us and soothes our weary souls. Now, today…imagine my surprise when I asked (just for fun) my new Echo Dot “Alexa play Gulch Radio” and it ACTUALLY WORKED! That’s a whole new level of possibilities. Can listen to you all over the house now. Thank you! Still hoping to see that livecam again someday…that 180 degree scan of Jerome was like a little slice of heaven. Thanks for all you do, Ric. Thanks for writing Jack – we plan on putting the camera back into action, but we have a lot of FM work to do before we can get to it. I used to keep the picture on my screens as background all the time. I’m sort of shut in these days, so looking a the cam was pretty refreshing. The Alexa link is great, I hope it brings us some more internet listeners. Who played the live acoustic version of little wing? Hey Bud – the time threw me there, I’m guessing you are on Mountain Daylight time – anyway, what I come up with is Monte Montgomery, Little Wing, live recording. That’s all the info I can find. Check it out and see if that is it. Thanks for playing “Old Jerome” this morning. I love that song. My pleasure – love that song and it’s very accurate portrayal of Jerome in the 1970’s – sad that Kate passed away so young, she had a beautiful voice and style. Oh my, so excited to try Gulch Radio on Alexa! I also agree about the live camera – I love watching the seasons change live in Jerome. We live in Colorado now but miss Jerome so much! I stalk Jerome real estate all the time and plan to actually get to live there soon. Thanks for all you do and all the great mood-improving music! Thanks for writing Devon, your letter was uplifting fo us. OMG! Welcome back! You have no idea how much you have been missed. Thanks for the note Beth! We are very happy to be back out there as well. We’ve got a lot to do to finish the project, so the signal and quality should improve as we finish the details. Hi Steve – we are on the air, but we aren’t done yet, we had to meet a deadline, so we did what we had to do. Improvement should come over time. I don’t think the signal is going to reach into the Salt Mine Road area of Camp Verde, but we shall see. We’re doing our best! Thanks for your patience. Enjoyed geezer rock today very upbeat for the most part. Thanks for the tunes. I try to keep the tunes upbeat – we geezers can use the lift!